It’s unmistakeable – as soon as Fall even hints at it’s arrival, the produce section in grocery stores across America start stocking up on figs, apples, grapes, pears, plums, artichokes, eggplant, pomegranates, and Brussel sprouts. Not only are these delicious, but they are beautiful and can really enhance your table scape. 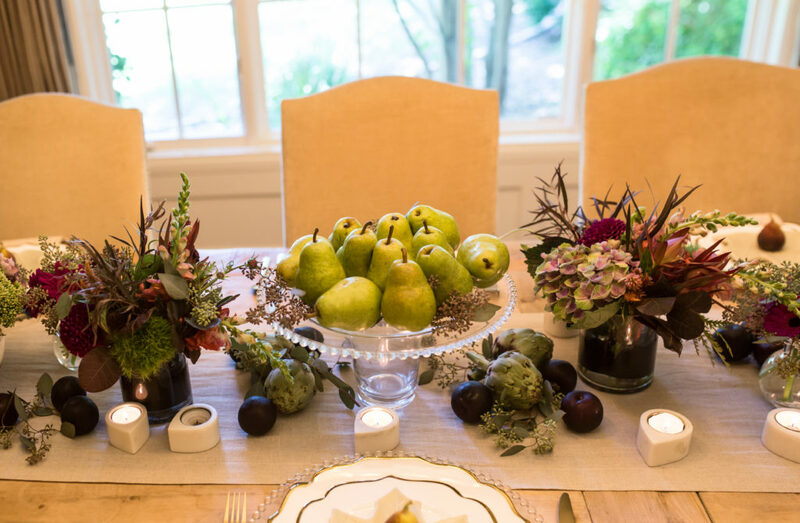 It’s easy to integrate them – I’ll show you how to include fall produce as table decor! Here, I’ve used one of my favorite dinnerware sets, mostly because it’s versatility. Gold rims give a modern touch while the scalloped edges lend to a vintage feel and ensure they work for just about any setting. Would you believe I found these sage green leaf plates in the dollar section at Target? Don’t overlook it next time you’re there! Seasonal appetizer plates are a great way to change up your place setting without spending a lot of money. To add to my Fall decor, I simply placed a Mission fig on top of the plate. 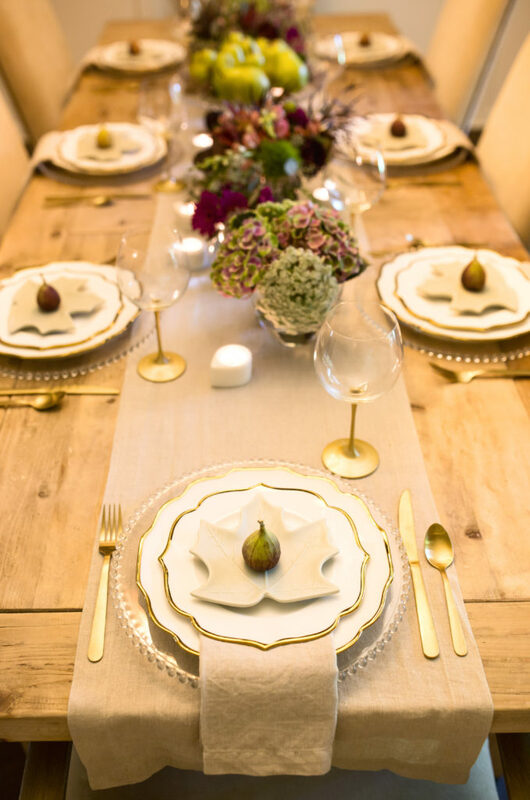 What could be easier than a plate full of pears to grace the middle of your table? To prevent waste, I buy these from Costco in bulk (when they are not quite ripe) so I can use them as decor for a few days, them enjoy them afterwards. 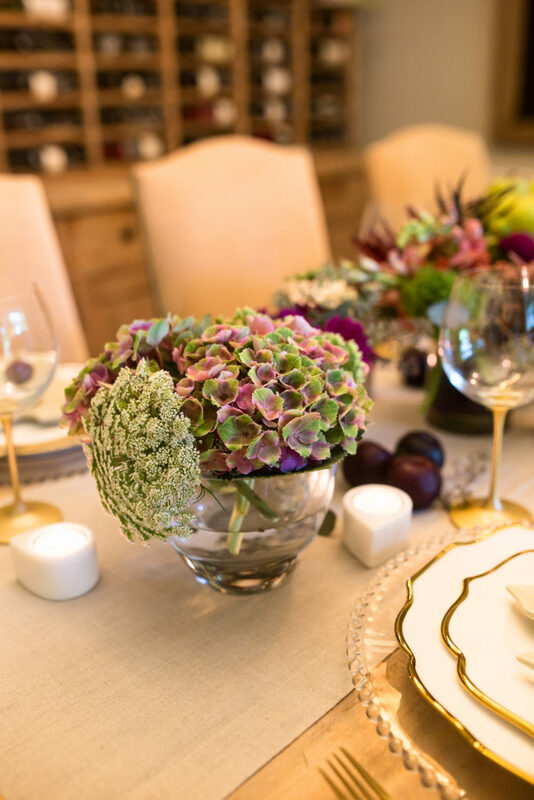 Keeping the table linens neutral helps the gorgeous hues of the produce take center stage. One of my staples: these flax linen napkins and table runner. I use them year-round for a muted, soft look. Arranging complicated floral centerpieces is not my forte, so I stick to one flower type to keep it simple. 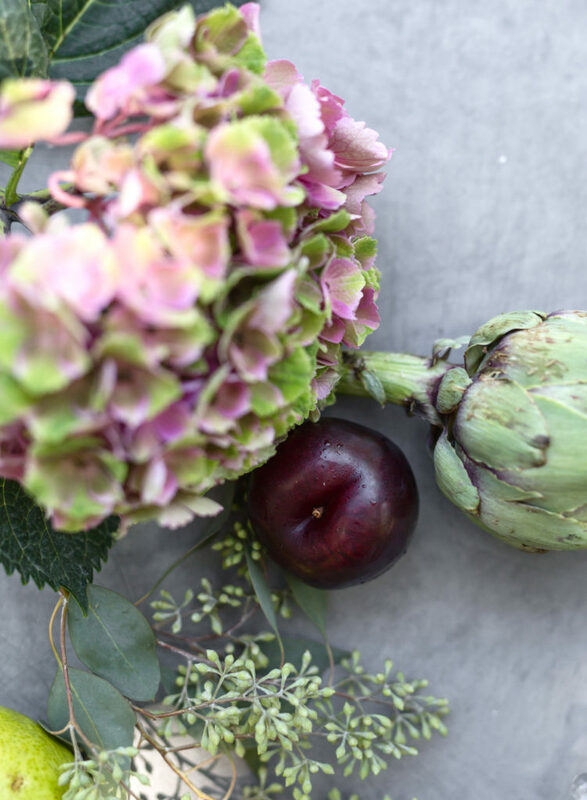 In season now, these antique hydrangeas pick up the colors of the pears and plums. 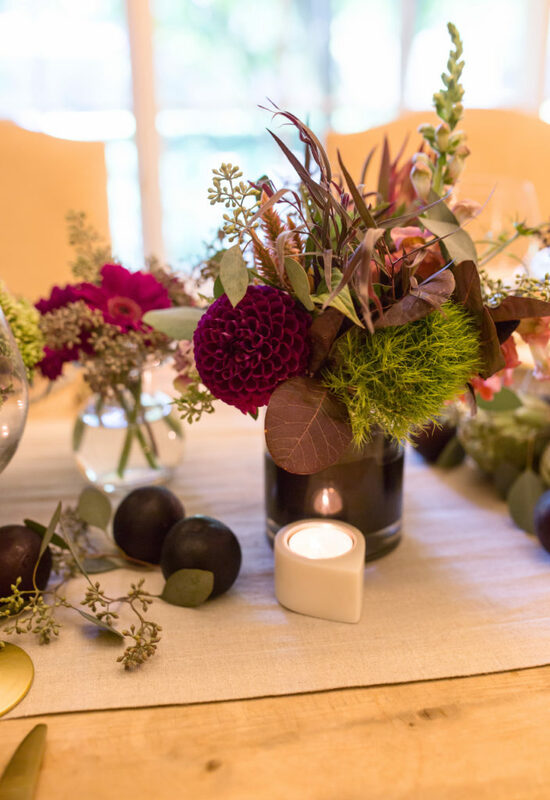 Marble votives, greenery from eucalyptus sprigs, artichokes and plums are scattered down the table runner for added detail. Created by a local florist, I left this pretty arrangement to the pros. Yes, I do tend to color-coordinate my attire with my table decor, probably because its easier for me to narrow down what to wear and ensures I don’t clash with my tablescape. Animal prints are on trend this season, so I took advantage of the opportunity to wear this gorgeous leopard print silk blouse for this occasion. I’m a sucker for a good animal print – I loved this blouse when I saw it and can dress it up with black pants and heels or down with skinny jeans and booties.